Universally compatible desk mount for 30” monitor screens or less. Mounting has never been easier! Just measure the mounting holes behind your screen and ensure they are 75 mm x 75 mm or 100 mm x 100 mm. The arm is capable of supporting 17.8 lb of weight. 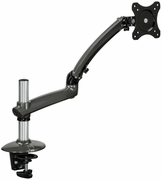 Height adjustable gas spring arm has a range of 13.25”. Full motion articulation can swivel 360 degrees around. The articulating arm has integrated cable management which means it can hide, bundle, and organize your cords beneath the arm.Monitor can rotate 360 degrees from portrait to landscape. It can also tilt up or down for a more ergonomic viewing angle. The combination clamp supports grommet and C-clamp installations. It is built to cover desks between .5” – 2.25” thick. Please ensure your monitor and desk are compatible with our mount.